Ramya is fascinated by linguistics and is eager to learn new languages. She is fluent in Tamil and is currently studying French, and she delights in finding connections between languages. She informally teaches Tamil to the children in her neighborhood. Ramya loves reading novels by Louisa May Alcott "because of the way simple ideas and stories are beautified in her works." Ramya's other hobbies include listening to music and bicycling. Serena enjoys interior design, sewing, and learning to play guitar and piano. In her spare time she likes photographing nature or cityscapes and going shopping. Serena has a passion for writing and literature, namely historical fiction and classics. Her favorite author is Jane Austen. Serena participated in the 2008 national finals. 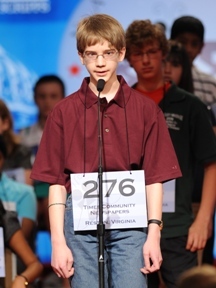 Kyle enjoys his time spent as a member of his school's scholastic bowl team. Other favorite hobbies include reading, playing chess and computer games, and drawing. He is keen to meet President Obama because he is "interested in what it's like to be president during a crisis." He would like to pursue a career in scientific research and biology. Kyle participated in the 2007 and 2008 national finals, tying for 10th place in 2008. Aishwarya, a voracious reader and dedicated student, has participated in university talent searches and scholastic bowl competitions. As team captain, she was instrumental in leading her Mathcounts team to state-level competition by winning first place in county-level competition two years in a row. Her role model is Amelia Earhart because "she followed her passion and dreams no matter what anyone said." 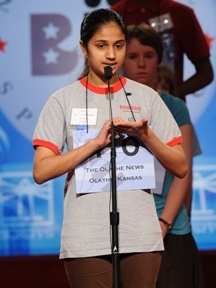 Aishwarya represented the Topeka Journal in the 2006 and 2007 national finals. Kennyi is a member of his school's Mathcounts team—a team that placed second in regional competition and also qualified for state competition. He plays clarinet in his school's band. Also, he loves to read: The Adventures of Huckleberry Finn by Mark Twain is his favorite book. 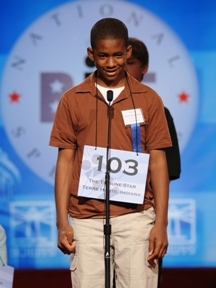 Kennyi participated in the 2007 and 2008 national finals and is well-known for conquering the giggles to correctly spell sardoodledom in the 2007 Bee. Sidharth enjoys competing. 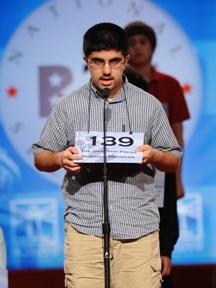 He participates in science fairs and plays competitive chess on his school's chess team. He is also on his school's soccer team. In his free time Sidharth likes to read or play tennis. An avid philatelist, he has collected multiple stamps and postage items from around the world. Sidharth enjoys all of his school courses, but he has the deepest appreciation for math and science. He would like to be a neurosurgeon. 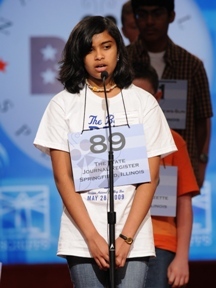 Sidharth placed second in the 2008 national finals. Tussah loves to immerse herself in music. She plays piano and cello and often composes her own scores. Tussah placed first in the 2008 Nevada Music Teachers National Association junior piano competition and has soloed with several local orchestras. Her other interests range from botany to Shakespeare. Tussah is fond of writing poems and prose. Her favorite sports are diving and swimming, and she admires the athletic achievements of Michael Phelps and Guo Jingjing. Neetu excels in math and music. 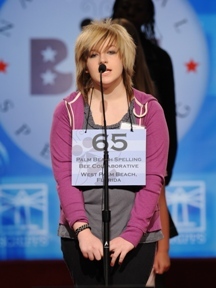 She has participated in a regional math competition and played clarinet in an all-county band concert. Neetu's favorite pastimes include badminton, basketball, hiking, and swimming. She collects coins and rocks and also speaks Hindi. Neetu aspires to become an architect or interior designer. 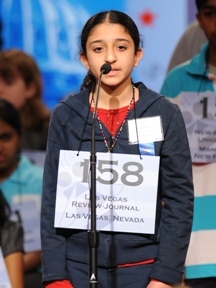 This is Neetu's third consecutive appearance in the national finals. Anamika takes private lessons in violin, Indian classical music, dance, and golf. 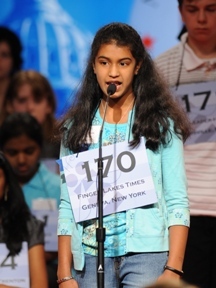 She has won several regional and national awards in science, math, essay-writing, and vocabulary contests. Anamika aspires to attend Harvard Medical School, where she hopes to specialize in cardiovascular surgery. She would like to author books in her spare time. A fan of science fiction and fantasy, Tim has devoted a lot of time to Star Wars, Star Trek, and The Lord of the Rings. He's studied the character of Gollum enough to pull off a terrific impression. Tim's team won the Virginia Regional Middle School Science Bowl, securing an opportunity to compete in the National Science Bowl in May. Tim's science background will help him as a future matriculant at the Massachusetts Institute of Technology, where he hopes to study physics or chemistry. Kavya enjoys practicing her violin, bicycling, swimming, and learning Indian classical dance. 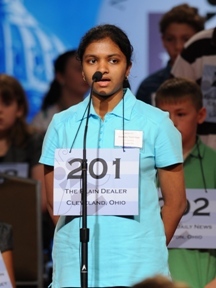 She names Nupur Lala, the 1999 Scripps National Spelling Bee champion, as her role model and the inspiration for her spelling career. She has plans for her future career as well: She looks forward to becoming a neurosurgeon. 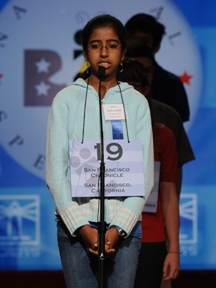 Kavya participated in the 2006, 2007, and 2008 national finals—tying for 10th, 8th, and 4th place, respectively.